Is iMessage not working on your iPhone or iOS device? 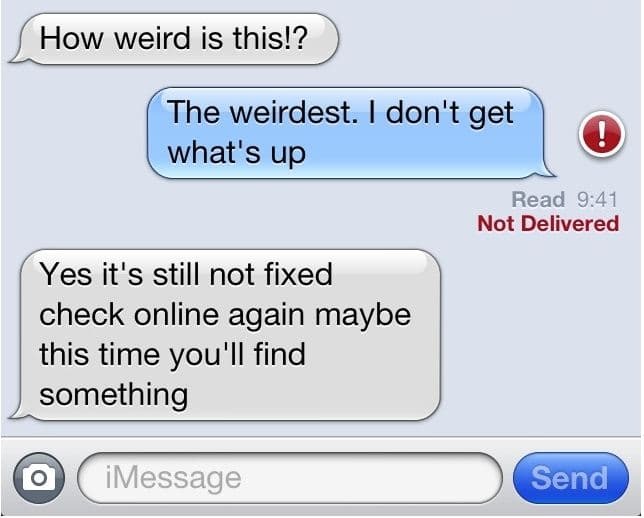 Don’t worry, you’re not the only one who’s having issue with iMessage. Apple today is receiving many complaints of their official forums from users having problems with iMessage. Users from all carriers including Sprint, AT&T and Verizon and Canadian carriers such as Fido are experiencing delays and send failures. This is also happening even if you’re using WiFi. It is believed that iMessage is not workign because Apple servers are down due to the release of iOS 6 tomorrow morning. The best thing to do now is to just turn off iMessgae by goiign to Settings > Messages and switch iMessage to off, this will send text messages or SMS as regular messages.